Face-to-Face communication is simply essential for business, leisure and your social life. Everybody struggles to understand speech in some situations, especially in noisy environments and bad acoustics – restaurants, coffee shops, office environments, schools, public transport, exhibitions, meetings, television rooms and so many other places, where you need to use your mental resources just to try to understand what is being said. 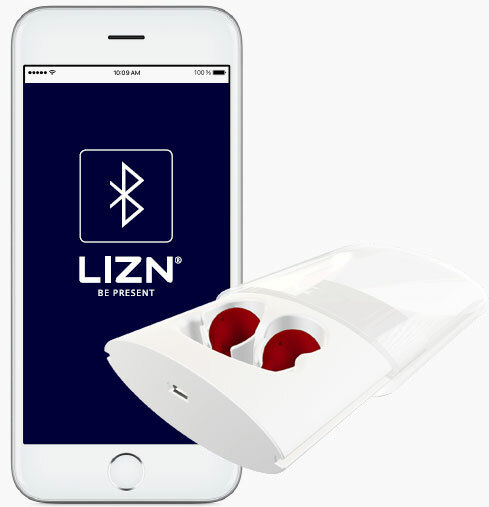 LIZN Hearpieces are Hearables with dual functionality. It works as an Earphone for music and phone as well as a Hearing device. When you are in Hearing mode the advanced sound processing system enhances the consonants in human speech. In combination with the directional microphone technology this improves your ability to understand speech in a noisy environment. You just have to point your nose in the direction of the person you want to listen to, and you will discover the difference. The Hearpieces constantly analyze the sound environment to adjust the amplification depending on the ambient noise level. The COMFORT level is satisfactory in most situations. However, if you want extra amplification, you can choose BOOST level using the convenient Finger Touch on one of the LIZN Hearpieces. Please observe that even the LIZN Hearpieces improves speech intelligibility for everyone, the product is not a hearing aid. Improving speech intelligibility is not just a question of amplification. If you amplify everything, you will feel even more stressed. The trick is to amplify the important sounds for speech comprehension and reduce the background noise. The LIZN Hearpieces dampen the overall noise with 5-7 dB, and it is only the frequency level of the consonants in human speech which is being enhanced. 1. You will improve your ability to understand speech due to the lower noise level. 2. Your ears will be protected in a noisy environment, and you will be able to stay double as long before your ears will be damaged. 3. You will feel much more comfortable and relaxed. 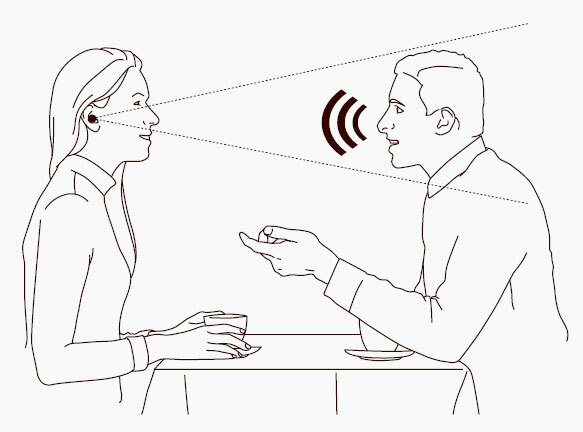 The LIZN Hearpieces are made for Face-to-Face communication. This involves not only the ability to understand what is being said. Naturally, you also want to speak yourself. If your ears are sealed completely, you feel like you are inside a bubble, and the unpleasant sound of your own voice makes it very uncomfortable to speak. This is called the Occlusion Effect. To avoid this the LIZN Hearpieces has an open fitting allowing a constant air stream between your ears and the surroundings. Thereby you will experience a natural sound of your own voice. Simplicity is an integral part of the LIZN DNA. LIZN Hearpieces offer an easy and convenient Finger Touch functionality, so you can control the product and your sound environment. There is no need for an app or any complicated gestures to control the functionality. Use a double tap on one of the Hearpieces to change between Earphone and Hearing mode. To answer a phone call, just use a single tap to answer, or use a double tap to decline the call. Whether you are in Hearing mode, listening to a pod cast or talking on the phone, you use a single tap on one of the Hearpieces to toggle between the two amplification levels COMFORT and BOOST, so you can increase your speech understanding when necessary. When in Earphone mode simply use the volume control on your smartphone or player to adjust to a comfortable sound level. When you remove the LIZN Hearpieces from the Charger they will automatically be switched on. Simultaneously the Bluetooth® connection between the Charger and the Hearpieces will open, so you can use them for music, telephone and similar earphone functions. You connect your smartphone to the Charger just by choosing LIZN in the Bluetooth® menu on the phone. Please be aware that the very small and discreet LIZN Hearpieces has only been possible to manufacture by using the Charger as a Bluetooth bridge to your phone or player. So, you must carry the Charger with you.